1. Explain what is free surface effect. 2. How is free surface effect minimised at the design stage of a vessel? 3. Describe the operational practices that will minimise free surface effect. 4. With the aid of sketches, describe the effect on the stability of a vessel when a vessel discharges a heavy weight using its own gear. 5. Describe the effect of water on deck on the stability of a vessel and means of reducing that effect. 6. Describe the effect on the stability of a vessel that has been bilged. 7. Describe the action to be taken to contain flooding in the event of underwater damage to the hull. 8. Explain the meaning of the term ‘Angle of Loll’. 9. Differentiate between ‘list’ and ‘loll’. 10 Describe the actions to be taken to correct an angle of loll. Check your answers and study the Workbook. 1. Free surface effect is the reduction in stability of a vessel caused by shifting water in slack tanks. Free surface effect reduces the size of GM. Therefore the size of GZ is reduced, and consequently the ability of the vessel to return to the upright position is reduced. 2. Free surface effect is minimised by partitioning tanks longitudinally. Where tanks are not divided by watertight divisions, there are usually longitudinal wash bulkheads which act as baffle plates. While these do not stop the sideways motion of fluids in the tank, they are designed to retard the flow so that the heeling force caused by the free surface effect is out of phase with the rolling of the vessel. 3. Free surface effect can be reduced by keeping the number of slack tanks to a minimum. As many tanks as possible should either be completely full or completely empty. 4. When a weight is lifted by a crane, the centre of gravity of the weight will be immediately transferred to the point the weight is suspended from (the head of the crane or the end of the derrick or boom). This occurs the instant the weight is lifted and from that point on the centre of gravity will not change further no matter how high the weight is lifted. 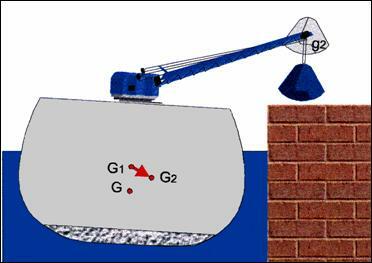 As soon as the weight is clear of the deck and is being borne by the crane head, the centre of gravity of the weight appears to move from its original position, to the crane head (g to g1). As the crane begins to swing the centre of gravity of the weight will remain at the head of the crane (g1). The vessel's centre of gravity (G1) will begin to move out towards G2, parallel to the movement of weight and the vessel will begin to list. 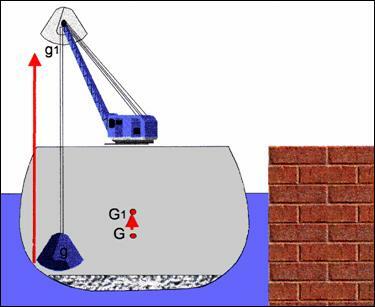 As the weight is landed on the wharf, it is in effect being discharged from the crane head and the vessel's centre of gravity will move from G2 to G3 in a direction directly away from G to G is therefore the final position of the vessel's centre of gravity. 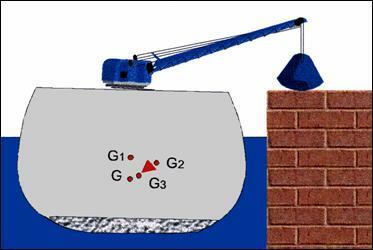 The net effect of discharging the weight is a shift of the vessel's centre of gravity from G to G3, directly away from the centre of gravity of the weight finally discharged (g1). 5. If water is shipped on board, then the effect is three fold. Firstly a weight is added high up in the vessel, thus reducing stability. Secondly, that water has a free surface effect, which will further reduce stability. Thirdly, the added weight causes the vessel to sink further in the water, thereby reducing freeboard, and reducing seaworthiness. Freeing ports are provided on deck, so that the water shipped on board can be cleared rapidly. These freeing ports should never be blocked. 6. When a compartment is bilged the buoyancy provided by the underwater volume of that compartment is lost, as is the reserve buoyancy of the enclosed volume above it. Before bilging, the reserve buoyancy was the entire enclosed volume above the original waterline. After bilging it is the enclosed volume above the new intact water plane area. If this compartment is to one side of the centre line then the vessel will take up an angle of list. Depending upon the location of the compartment, the vessel may also trim by the bow or stern. In any case, draught will increase, freeboard and therefore reserve buoyancy will decrease, and the effect is always to reduce stability. 7. In case of flooding, the biggest danger is the loss of watertight integrity and the subsequent loss of internal buoyancy from the damaged areas. Your immediate action in this case should always be to close all watertight doors through the vessel to prevent further loss of buoyancy. It may be possible in some cases to bring the damaged area out of water deballasting the vessel or providing a list on the opposite side to the damage. 8. The term loll describes the state of a vessel which is unstable when in an upright position and therefore floats at an angle to one side or the other. If disturbed by some external force, caused by wind or waves, the vessel may lurch to the same angle of loll on the opposite side. 9. List is the inclination of a vessel caused by unequal distribution of weights on either side. Loll is an inclination of a vessel which is unstable when in an upright position. 10. To correct for loll the following procedure should be observed. First verify that it is loll and not list. Lists are caused by shifting of cargo or uneven distribution of fuel, water or cargo. If none of your cargo has shifted, and your fuel and water tanks are more or less even on both sides, then you should suspect that your vessel has loll. You must lower the centre of gravity. There are two options open to you. i) You can take ballast. If you do so, (and if your vessel has ballast tanks that you can fill) then you should begin by pressing up tanks on the low side first. This will initially make your angle of loll worse because you are adding weight on the side to which the vessel is leaning, and you are introducing a free surface (if you are ballasting on an empty tank). This is still safer than ballasting the high side first, because that could cause the vessel to flop-over to the other side, and possibly capsize. ii) The second option open to you is to remove the cause. A loll does not suddenly occur. It is a result of decreasing stability which is caused by the progressive raising of the centre of gravity of the vessel. This can only occur if you are loading weights on deck, and using fuel or water from low down in the hull (where most tanks are located anyway). In these circumstances you may have to jettison cargo.